Coffee grinder is an important machine to produce the coffee ground. This machine will contributes on how the coffee will taste when brewed. It is not as easy finding a good home-use coffee grinder out there, so let us introduce you to two famous coffee grinder loved by many people. They are Breville BCG820BSSXL and Baratza Virtuoso. Breville BCG820BSSXL is a one coffee grinder product manufactured by an Australian Company Breville, founded in Sydney in 1932. This company activity is manufacturing and marketing small home appliances such as contact grills, kettles, espresso machines, toasters, microwave ovens, pressure cooker, coffeemakers, and various similar things. The Breville BCG820BSSXL is available throughout more than 30 countries, including United States, China, Brazil, Canada, South Africa and Israel. The smart grinder is available in many retail stores and comes with three variant of color, such as black sesame, silver, and cranberry red. Breville BCG820BSSXL is said to be the coffee grinder that outsmart all the home-use grinders, because it offer more settings than many other grinders, which will provide you with more control on your hand. The Dose IQ feature, will allow you program your favorite grind and then quickly change the number of servings. You can do a quick grind and the machine will remember the dose to be used in the future. The hopper can be removed to ease you when swapping beans with 18 oz capacity and give you access to the burrs. The Breville BCG820BSSXL comes with accessories, such as Portafilter Cradle in Small and Large, Grinds Container with Lid and sealing cap, and Conical Burr Cleaning Brush. Read our previous comparison between : Cappuccino vs Espresso. Baratza Virtuoso is coffee grinder form the American company with the same name. This company main activity is producing consumer-level grinders to be use at home. Baratza Virtuoso claims to be able to grind either coarse grind for French press or finer grind that is famous in espresso making. It promised the consistency it can offer from cup to cup. Baratza name is well-known in coffee gear industry, even though it only founded in 1999. Their products are widely recognized as some of the best coffee grinders available. Baratza Virtuoso is able to provide you with the ability but comes in the price of end-consumer. Baratza Virtuoso comes with 40mm conical burrs that grind coffee at 1.5 to 2.4 g/second, depending on your preferred setting. It is recommended to pay attention to the adjustment, since it are in increments of two, you may set it too coarse or too fine if you are not careful. The bean hopper capacity is 8 oz. suitable for all home use with the ground capacity of 5.0 oz. Baratza Virtuoso comes with 60-seconds timer with segmented graphics for easily repeatable grind times. Baratza Virtuoso has some accessories, which may purchase separately such as Portaholder, the replacement for the ground bin that hold the espresso portafilter for hands free grinding directly and Hopper Extender, which is an extension that can add 9 oz. capacity to the standard 8 oz. bean hopper. 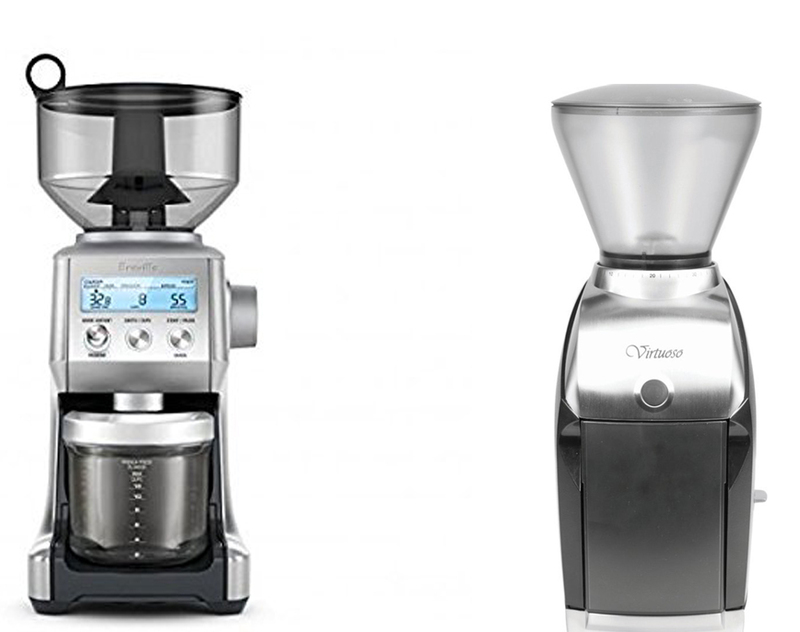 Both of Breville BCG820BSSXL and Baratza Virtuoso are marketed towards end-user, which means it is used in home for home brewing. Both of them also use conical burr to grind the coffee beans. What differs them are their capacity, automation and grind settings. Breville BCG820BSSXL hopper size is 16 oz., while Baratza Virtuoso is only half of it. Their automation also different, with auto dosing in Breville BCG820BSSXL and auto resetting in Baratza Virtuoso. Breville BCG820BSSXL also have wider grind settings with 60 settings, while Baratza Virtuoso only 40 settings. From the price point Breville BCG820BSSXL also more affordable compare to its rival, so in our opinion it is better to opt for Breville BCG820BSSXL. Cuisinart DBM-8 Review: Affordable and Easy to Use!